Stanley is one of those towns that takes you back to a remotely familiar time, even though you may not have grown up in the wild west “back in the day.” When you arrive in Stanley and see the dirt roads and wooden boardwalks it’s easy to picture yourself in a time when riding horses and shopping at the general store was the norm. Although Stanley retains that feel, running water, electricity and high-speed internet are now the norm. Whether you have been here before or are coming for the first time, if you are interested in getting to know Stanley and the Sawtooth Valley better then check out this book. Traplines: Coming Home to the Sawtooth Valley by John Rember. Here’s a teaser from Random House. In 1987, John Rember returned home to Sawtooth Valley, where he had been brought up. He returned out of a homing instinct: the same forty acres that had sustained his family’s horses had sustained a vision of a place where he belonged in the world, a life where he could get up in the morning, step out the door, and catch dinner from the Salmon River. But to his surprise, he found that what was once familiar was now unfamiliar. Everything might have looked the same to the horses that spring, but to Rember this was no longer home. 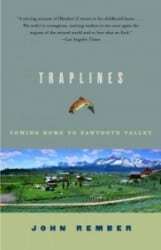 In Traplines, Rember recounts his experiences of growing up in a time when the fish were wild in the rivers, horses were brought into the valley each spring from their winter pasture, and electric light still seemed magical. Today those same experiences no longer seem to possess the authenticity they once did. In his journey home, Rember discovers how the West, both as a place in which to live and as a terrain of the imagination, has been transformed. And he wonders whether his recollections of what once was prevent him from understanding his past and appreciating what he found when he returned home. In Traplines, Rember excavates the hidden desires that color memory and shows us how, once revealed, they can allow us to understand anew the stories we tell ourselves. This entry was posted on Thursday, December 12th, 2013 at 1:47 pm	and is filed under Idaho, Salmon River, The River Company. You can follow any responses to this entry through the RSS feed.